Cumberland is located close to Courtenay on Vancouver Island but is a much smaller town. 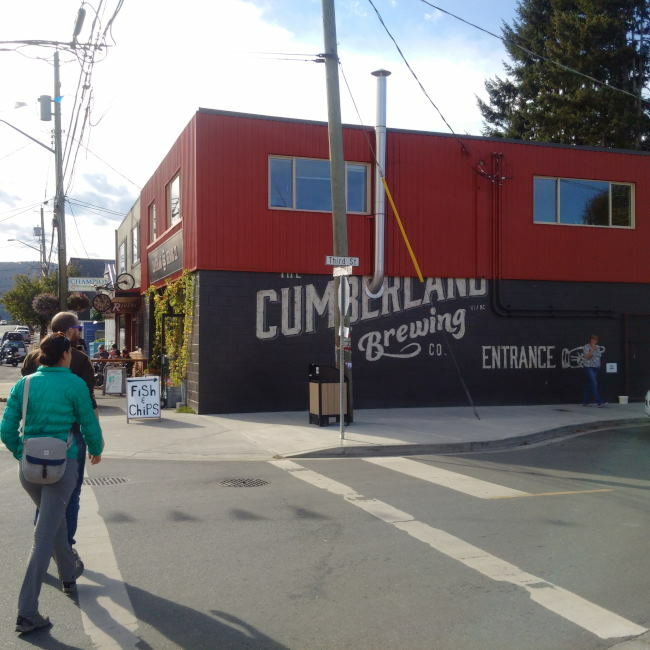 Even being a smaller town they have a brewery called Cumberland Brewing. Cumberland Brewing has a really welcoming feel to the building with a great sign and hops growing everywhere. The entrance is off to the side of the building and houses a big patio. The front of the building has a door they only open for air movement and probably deliveries. Once inside you find a great little lounge that has not only their beer but also food options. I found it amazing that such a small town could have a tasting lounge and patio so full! It was hopping! The staff was really friendly on my short visit and so were the customers. I had a great conversation with a local woman that was sitting beside me at the bar. Like many breweries the brewery itself is located in view of the tasting room. With Cumberland Brewing it was right in front of the bar where I was sitting. They were actually brewing something for a cask while I was there. If you find yourself in the small town of Cumberland make sure to check out the brewery. Just be ready for a very busy place on the weekend! This entry was posted in Beer Travel, Brewery and tagged bc, beer, brewery, canada, craft beer, Cumberland, cumberland brewing, vancouver island.